Large 5 bedroom house in a great location. Unfurnished but at this price it wont last long. A minimum of 3 year lease at 65 ooo ooo IDR per year for a 5 bedroom 3 bathroom house. The garden is nicely landscaped and large it runs all the way in front of the property. Also has two temple 1 large and 1 smaller. A Closed garage for two cars and motor bikes are safe with a large sliding iron gate. This new condominium is located in the heart of Sukhumvit. Close to many world-class facilities: Less than 10 minutes walk to Emporium shopping Mall. Near Prompong Skytrain. 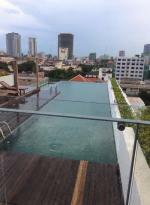 50 meters to Samitivej Hospital and to American School of Bangkok & Japanese School. 200 meters to Villa Market. Just a short walk to Benjasiri Park. 1 bedroom, 1 bathroom, fully furnished. Size: 49 sqm. Newly renovated, Roof top garden, swimming pool, fitness, security CCTV. Condo also provides a tuk tuk service.